Time for the "Things I Am Loving This Week", the (mostly) food related things I am enjoying and want to share. I love a good carrot cake and I was craving it the other day, but I wanted something a bit healthier, less sweet, and less fat. I was happy to find a recipe for Carrot-Pineapple Cake with Apricot Cream Frosting in "Cooking For the Seasons at Rancho La Puerta" by Deborah Szekely and Deborah Schneider, a new favorite spa cookbook I recently purchased. For portion control I made it into cupcakes instead, (and anyway, cupcakes are just more fun to eat). I used all white-wheat flour (Basically because I was too lazy to dig out the canister with the white flour too! ), and ended up with a moist, flavorful cupcake that even makes a great breakfast "muffin" without the frosting. Yum! With the Watermelon Aqua Fresca I made from it a couple weeks ago, this cookbook is two for two with good recipes. The book says, "Most carrot cakes deliver healthy ingredients with loads of fat. In this very simple, moist cake, applesauce is substituted for the usual oil, and crushed pineapple adds moistness and flavor. The cake is delicious even without the creamy frosting--try serving it lightly dusted with powdered sugar, alongside a citrus salad or fresh pineapple." Preheat oven to 350 degrees F. Lightly brush an 8-inch pan with oil. Beat the eggs with the orange zest and sugar until thick. Stir in the applesauce and the vanilla. Sift the flours, baking powder, and baking soda into a large bowl. Stir the egg mixture into the flour mixture, then fold in the carrots, pineapple, and coconut. Spoon the batter into the prepared cake pan and bake for 35 to 40 minutes, or until a skewer inserted in the center of the cake comes out clean. Cool the cake in the pan for 10 minutes, then turn out onto a rack and cool completely. To make the frosting, soak the apricots in hot water until they are very soft. Drain thoroughly. With a hand mixer, whip the Neufchatel until smooth and fluffy. Beat in the powdered sugar and the 1/4 tsp vanilla, fold in the apricots. Spread the frosting evenly over the top of the cooked cake, and cut into thin wedges to serve. Note: The cookbook suggests variations such as adding 1/2 cup golden raisins, soaked and drained to batter, sprinkling the chopped apricots over the cake instead of mixing them in the frosting, adding chopped pecans to the batter, or making it as a loaf cake or cupcakes. Finally, I was so sad to hear that Sheila Lukins, cookbook author and co-founder of The Silver Palate, the famous NY gourmet food store, passed away on Sunday from brain cancer at age 66. 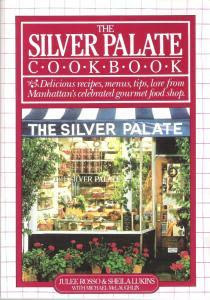 "The Silver Palate Cookbook", which Lukins co-authored with Julie Rosso, came out in the early 80's. It was not my first cookbook, but it was one of the first "grown-up" cookbooks I bought myself when I started living on my own, and one I still love today. Growing up, we had delicious food but really simple food and I can still remember the first time I picked up "The Silver Palate Cookbook" and started reading it. I was fascinated by the recipes, the tips, the amazing variety of dishes and things I had never heard of, or had heard of but had never tried, and never would have thought about attempting to make. (This was in the days waaaay before Food Network my children). ;-) To be honest some of the recipes freaked me out a bit--lets face it, no one I knew was making or eating Herbed Caviar Roulade, Turbot En Bourride, or Roast Sucking Pig and it totally fascinated me. "The Silver Palate Cookbook" influenced me to try new things and some of the recipes became favorites like the Chocolate Mousse, the Tarragon Chicken Salad and the Black Bean Soup. Although "The Silver Palate Good Times Cookbook", "The New Basics", "All Around the World" and other Lukins and/or Russo books joined my collection over the years, "The Silver Palate Cookbook" is the one that owns a little piece of my foodie heart. I pulled it out to reminisce and saw a well-tabbed favorite recipe that I hadn't made in a while, Spicy Shrimp. The recipe is one of the first ones I tried because it sounded (and is) simple to make. I never quit understood why they called it "Spicy Shrimp" since it isn't spicy, (maybe "Garlicky Dill Shrimp"? ), but it is very good and I had what I needed to make it for dinner. So Sheila Lukins, may you rest in peace--your talent and influence will be greatly missed. This one is for you. Peel and devein shrimp. In a large skillet over low heat, melt butter with olive oil. Add garlic and shallots and saute for 2 minutes without browning. Add shrimp, increase heat slightly, and cook shrimp for 3 minutes, or until just done to taste. Add salt and pepper to taste and toss well. Remove to a bowl, scraping in all the sauce. Add lemon juice and dill; toss together well. Cover and refrigerate 3 to 4 hours before serving. Adjust seasonings to taste. Serve as a first course or on the ends of long bamboo skewers as an appetizer. So that is what I am loving this week! How about you? You know my predilection for all things carrot cake and cream cheese frosting related so this is a definite bookmarked recipe! Looks delicious and i love cupcake form as well. Those chocolates look marvelous. Everything looks great...but OMG those sea salt caramels are amazing!!! I SO want to pop one in my mouth...I can almost taste them!! I never met a cupcake, chocolate, or shrimp I didn't like. Everything you've shared with us today looks wonderful. Pass the sea salt caramels, please. So sad that she is gone. I too love that cookbook - it is one of my "keepers." Food sure was different back before the food network. Good thing for books like The Silver Palate. The shrimp look so pretty! Oh, I had not heard about Sheila Lukins - how sad! That is really a fabulous cookbook; you've inspired me to cook from it more. Your carrot cupcakes look healthy and delicious - I definitely need to make them. Oh, and the sea salt caramels look divine! I remember being so intimidated by the Silver Palate cookbook - amazing how far we have come! Oh! The carrot cake with the apricot frosting made my mouth water...and the shrimps look so yummie as well. Great pictures! I love that cookbook - it introduced me to many new things. Just read the Sheila Lukins passed away either today or last night. I hadn't heard about Sheila Lukins passing - I am so sad. I was just looking in my "Silver Palate Good Times" earlier this week for some quiche combinations. Like you, this was one of the first cookbooks I owned, sent to me by my v. glamourous NY city godmother. I loved the generosity of spirit and flavour behind the recipes...reminds me a bit of Ina in fact. All of that sounds just wonderful! I love carrot cake, I think the caramels sound superb and the shrimp looks really delicious (if not spicy). Not long ago I made a quadruple batch of the carrot cake recipe to serve at a cookbook signing (yes, I work for Rancho La Puerta). I used to work at Sunset magazine, so I do love to cook. There must have been 200 small slices out on the table...and they were gone within minutes. I liked the moistness of this recipe...and the fact I wasn't using such copious amounts of oil often found in other carrot cake recipes.